The dwarf planet Haumea [pronounced how.MAY.ah] is farther away from the Sun than Pluto. It never gets closer than 35 AU. An AU (astronomical unit) is the distance from the Earth to the Sun. So Haumea is 35 times farther from the Sun than we are. At its farthest from the Sun, Haumea is 51 AU away. It takes so long to get around the Sun that its year is almost 285 Earth years long. Although Haumea has a long year, it has the shortest day of any Solar System body that we know of – four hours long. If Haumea were spinning much faster, it would break apart. 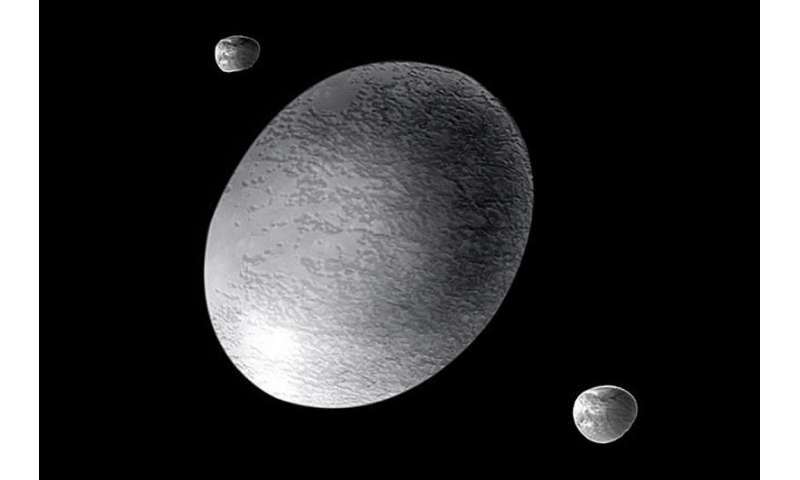 Haumea has two moons, Hi'laka and Namaka. Hi'laka is around 310 km (190 miles) in diameter, and Namaka is even smaller, with only 10% of Hi'laka's mass. Hi'laka orbits the dwarf planet's equator every 49 days. 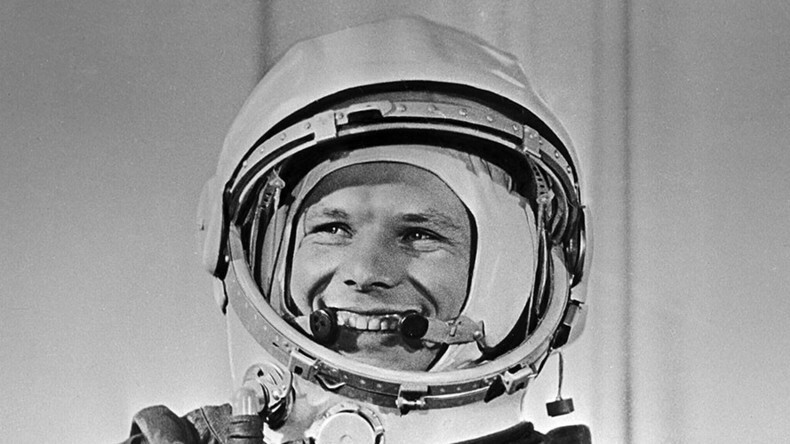 But Namaka takes 18 days in an orbit tilted to the equator and is almost cigar-shaped. If a body has enough mass, gravity pulls it together in a rounded shape. However, Haumea spins so fast that it's shaped more like an egg than a ball. Although Haumea is small now, it used to be part of a larger body. In the early days of the Solar System, a massive collision broke up the original body into a number of smaller ones. Haumea was the largest piece, but there are also its two moons and at least five other objects. It's also likely that this collision was what set Haumea spinning so fast. It's a long way off, but Haumea is bright enough for amateur astronomers to see in their telescopes. It seems to be covered with a layer of very reflective ice, and an infrared telescope showed a dark red area. 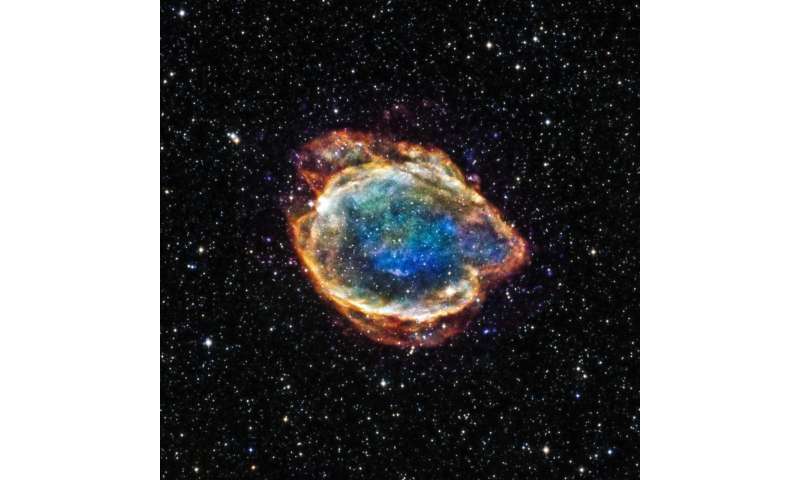 Astronomers aren't certain what the reddish spot looks like, or what caused it. Perhaps it's rich in minerals or a scar from an impact that left some kind of darker material behind. Amazingly, Haumea has a ring. The Solar System's four giant planets have rings, but otherwise rings are rare. Haumea is the only Kuiper Belt object known to have a ring. Haumea was named for a Hawaiian goddess of fertility and childbirth. The goddess had many children, including Pele, the goddess of fire and volcanos. Some of her children sprang from different parts of her body. This echoes the creation of Haumea's moons and other bodies that broke off from a parent object. The moons were named for the goddesses Ki'laka and Namaka, two more of Haumea's children.